Social media platform such as Facebook, Twitter, YouTube, etc. have grown very popular in recent times. People have been spending a lot of their time on any or all of this media. So, it is beneficial to the business if social media is utilized to establish personalized relationship with the customers. This will help you to increase awareness and likability of your brand in the long run. 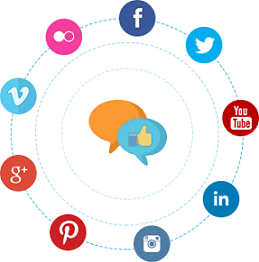 Our Social Media Optimization services will help you to establish and expand your presence across multiple social media channels. Ginger Domain helps you to set up advertising campaigns on a wide variety of social media platforms so as to reach maximum number of potential customers. We focus on building a positive image of your brand by the means of regular engagement with your target audience and keep track of their demands and needs. How does Social Media Optimization (SMO) Services work ? Conducting thorough research about your company and its associated industry before connecting your business with various networks and communities on social media sites that are relevant to your products and services. Ensuring that the content which has been optimized by including keywords is appealing as well to the online users. Making use of viral media such as podcasts, audio and video streaming for increasing brand awareness. Letting users share information about your business easily with other users by integrating social bookmarking and tagging to your website so as to increase your customer base. Analyzing the performance and result of your social media campaigns by conducting social media audits regularly to derive maximum benefit. With Ginger Domain, you can acquire new heights socially. We provide services that ensure maximum audience reach for your business which, in turn, will lead to increased number of customers.